If your dog has suffered a sudden trauma or is experiencing any life-threatening symptoms, please call us immediately at: (219) 247-0555 during normal business hours. In an emergency, time is of the essence. For external bleeding due to trauma, try to elevate the affected area, and apply direct pressure to the wound. This could include constructing a makeshift tourniquet to isolate an affected limb. Most importantly apply firm pressure with towels and keep pressure applied until you arrive at an emergency hospital. Placing pressure over a wound will help to stop the loss of blood. 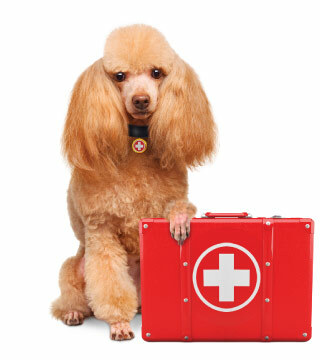 We recommend learning various ways to perform first aid for dogs. The only way to be prepared in an emergency situation is to educate yourself before an emergency occurs. 1494 ½ N. Main St.